Many students comment that the size of campus is just right—not so big that it’s easy to get lost, but not too small, either. They often say they feel right at home. 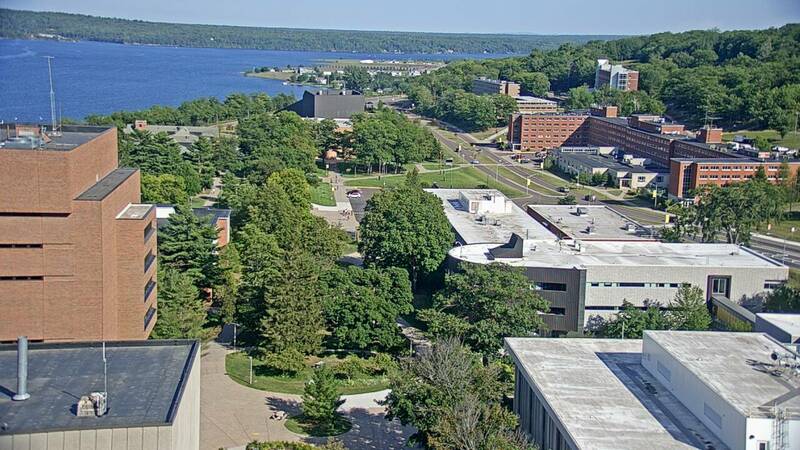 Our beautiful campus in Michigan's Upper Peninsula overlooks the Keweenaw Waterway and is just a few miles from Lake Superior. Michigan Tech wouldn't be the same anywhere else on earth—and we wouldn't have it any other way. 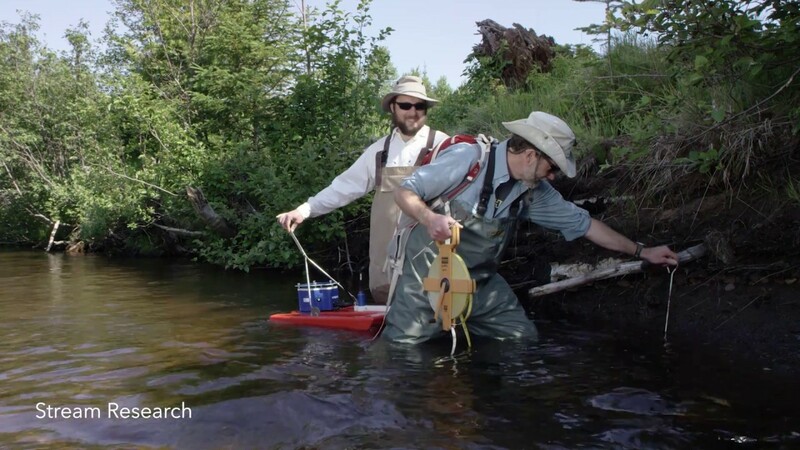 Research at Michigan Tech brings faculty, graduate and undergraduate students, community, government, and industrial partners together to create the future. Historic US Highway 41 winds its way to Michigan Technological University, hugging the southern edge of campus to separate dorms and recreation from academic facilities. Enter campus from the east to walk through the Rosza Center for the Performing Arts. View visual arts exhibits and installations, and peek into the performance hall, before taking the catwalk into the Walker Arts and Humanities Center. Walker houses Michigan Tech's Humanities Digital Media Zone, a modern language lab, the McArdle Theatre, and the Multiliteracies Center. Exit Walker and head west. Check out the architectural detail of Douglass Houghton Hall, built in the late 1930s. A few steps later and you'll come to the border of world-class research in engineering and the hard sciences. On your right is the Minerals and Materials Engineering Building (locally known as the M&M), home to one of the few university-run foundries in the nation, as well as three cutting-edge biomedical engineering research labs: the Regeneration and Repair, Engineered Biomaterials, and Biosensors Laboratories. Fisher Hall is on the left. Tech's physics and math departments live here—and so does the campus movie theater. Connected to Fisher is Rekhi Hall, where you can find the Department of Computer Science and the Computer Science Learning Center. Look ahead and see The Dog. 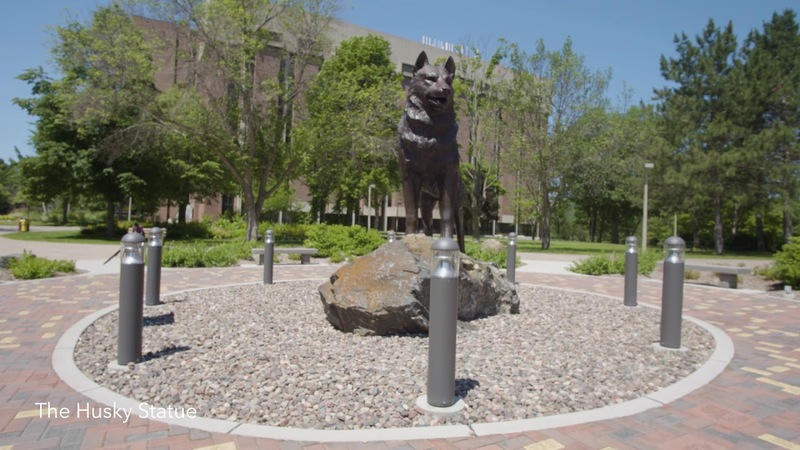 Our nine-foot-tall, 1,600-pound Husky statue stands on a 19-ton Baraga County boulder that is 1.8 billion years old. More than 1,000 personalized engraved stones surround the statue. Left of The Dog is the J. Robert Van Pelt and John and Ruanne Opie Library, recently upgraded with 250 new computer workstations; new scanners and printers, including a 3-D printer; improved wireless access; and functional, ergonomic furnishings and workspaces, including laptop bars and booths. Across the way are Dillman Hall, the Dow Environmental Sciences and Engineering Building, and the Electrical Energy Resources Center. The Memorial Union Building (MUB) is just ahead. Inside you'll find the Keweenaw Commons Food Court, featuring a wide variety of international, freshly made foods. The MUB also houses student organization offices, the Campus Bookstore, meeting rooms, ballroom space, and the John Edgar McAllister Welcome Center. Across from the MUB is the Chemical Sciences and Engineering Building (ChemSci). Inside, the world-class Unit Operations Laboratory and Process Simulation and Control Center boast 6,500 square feet and a three-story open bay dedicated to chemical-processing education. Next door is the R. L. Smith Mechanical Engineering-Engineering Mechanics Building (MEEM). At 11 stories, the MEEM provides more than 55,000 square feet of laboratory space. It's also where you'll find the Engineering Learning Center and the Active Learning Center—also called The Fishbowl—a modern, interactive, and collaborative computer lab. Past the MEEM and MUB you'll find the ROTC Building, Academic Offices Building, Administration and Student Services Building, and Alumni House. The Alumni House was built in 1916 by Dr. Rudolf J. Maas, the doctor for Franklin Mining Co. who had a private practice in the home. The home was sold to the University in 1961. Michigan Tech's fifth and sixth presidents lived in the house until their respective retirements. Cross over Highway 41 to reach the Harold Meese Center to spend time in the Immersive Visualization Studio, or turn right down Phoenix Drive to make your way to the Great Lakes Research Center (GLRC). The GLRC provides state-of-the-art laboratories where faculty members from many departments across Michigan Tech's campus collaborate on interdisciplinary research. The GLRC also contains a lake-level marine facility and convenient deep-water docking, providing a year-round home for Michigan Tech's surface and sub-surface fleet of marine vehicles. The Student Development Complex (SDC) is a 235,000-square-foot facility that provides a wide range of recreation and fitness options for students, faculty, staff, and the community—including a fitness center, swimming pool, climbing wall, racquetball courts, a multipurpose room, and a studio for class in dance, yoga, aerobics, and martial arts. The SDC is also home to the John J. MacInnes Student Ice Arena (the Mac), which has a seating capacity of 4,200 and fourteen rentable luxury suites/skyboxes. The Mac is home to Michigan Tech's NCAA Division I hockey team and was voted the #2 best hockey arena experience in Michigan in 2012 by Stadium Journey magazine. In addition to varsity hockey, the arena is used for intramural hockey, kinesiology and integrative physiology classes, recreational skating, youth and adult hockey, figure skating programs, private rentals, and special events. North America's premier mineral museum, the A. E. Seaman Mineral Museum is internationally recognized by mineral collectors and connoisseurs. Featuring the largest public exhibit and finest collection of minerals from the Great Lakes region, and the world's best collection of Michigan minerals, the museum exhibits feature the rich colors of nature's masterpieces. Engineering meets art. Michigan Tech's Rozsa Center for the Performing Arts is the leading arts presenter in the Western Upper Peninsula. Performances include national- and University-produced theatre, jazz, orchestra, symphonic bands, choral music, dance, and film, as well as visual art exhibitions and installations. With a 3,800-square-foot main stage, and 1,067 seating capacity in the main theater, the Dr. James A. and Margaret C. Black Performance Hall is built for great events—and transforms into a 583-seat proscenium theatre or an intimate 250 seat jazz club. Performance facilities and practice spaces include the 1,448-square-foot Choral Room, and 1,790-square foot Band Room. McArdle Theatre is a flexible black-box theatre used for theatrical performances, live concerts, music festivals, and studio recording sessions, as well as a film sound stage. The Portage Lake Golf Course is rated one of the top 18-hole courses in the Upper Peninsula. The course sits on 160 acres and offers two nines of distinctly different challenges. Mont Ripley is the oldest ski area in the state in the snowiest town in the Midwest. The Weather Channel ranked Hancock, Michigan, as the third snowiest city in the United States. Mont Ripley Ski Area is owned by the University and located one mile from campus. The Ford Center and Forest is located about 40 miles south of Michigan Tech's main campus and 10 miles from the shores of Lake Superior. The Center is an outdoor and environmental education center with full-service conference facilities and lodging in historic Alberta Village, built by Henry Ford and donated to the University in 1954. The core lands of Ford Forest are a 3,700-acre mosaic divided into the Baraga Plains tract and Ford property in and around Alberta Village. The Michigan Tech Research Institute (MTRI) is located in Ann Arbor, Michigan, and is a recognized leader in the research, development, and practical application of sensor and information technology to solve critical problems in national security, protecting and evaluating critical infrastructure, bioinformatics, earth sciences, and environmental processes. MTRI's outreach activities are designed to provide educational programs, technical expertise, tools, data, and information, and make them available to the public and stakeholders to promote awareness and improve environmental management. The Keweenaw Research Center (KRC) combines science and engineering to develop new technologies and solve real-world problems. KRC provides applied research solutions through Laboratory Based Evaluation, Computer Based Modeling and Analysis, Vehicle Testing and Evaluation, and Snow Research. KRC maintains more than 740 acres of proving grounds, including many miles of prepared test tracks. Ride and handling loops, a circular track, an ice rink, a snow-packed area, and a rugged off-road obstacle course all provide the backdrop for research in vehicle mobility. The Advanced Technology Development Complex (ATDC) is a cooperating site of the Michigan Tech Enterprise SmartZone (MTEPS), a partnership between the University and the cities of Houghton and Hancock to support technology transfer and high-tech development in the region. ATDC is a 27,000-square-foot building that houses the Ford Student Design Center, the Keweenaw Research Center's dynamometer, the Office of Innovation and Commercialization, and lease space for business startups. A recently completed facility within ATDC houses Michigan Tech's FEI 200kV Titan Themis Scanning Transmission Electron Microscope (S-TEM), a true atomic resolution instrument that is one of only a handful in the Upper Midwest.